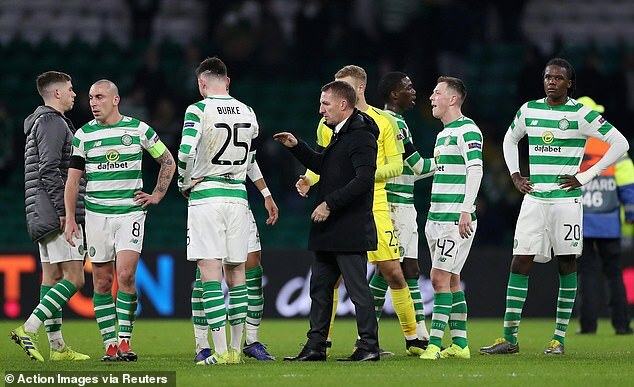 In January Celtic boss Brendan Rodgers revealed the Celtic Park’s new pitch has been struck down by a ‘slight disease’, and after a gruelling 90 minutes in Spain, midfielder Brown made his own comparisons. He said: ‘We played really well, played proper football on a proper football pitch, and until the sending off we were the better team, creating chances, and we just didn’t get the ball in the back of the net. ‘The first performance back at Celtic Park wasn’t good enough but then again you look at the difference of the pitches. ‘Their pitch was incredible and we knocked the ball about really well. Celtic Park is not so good just now. ‘Hopefully our pitch gets better and we go on a good run in the league now. We spent a lot of money on the park and it is not up to the standard that we want it to be. 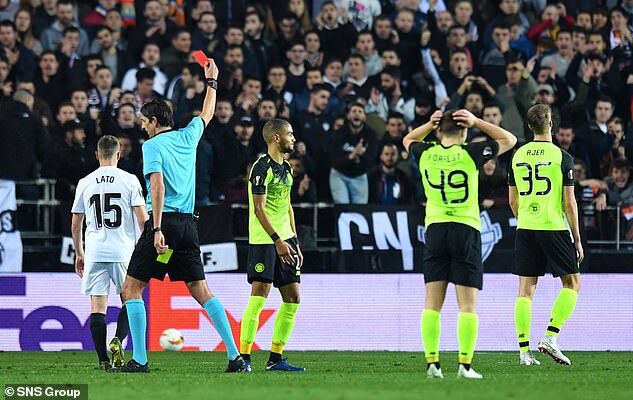 Brown conceded Toljan’s sending off, for a foul on midfielder Goncalo Guedes, was ‘always going to be the turning point of the game’. He said: ‘The red card decision is very soft, a bit harsh, but that’s European football for you. Sometimes you get away with them, sometimes you don’t. ‘We still tried to play our way, to focus on keeping the ball and creating chances, but it is always going to be hard against 11 men. ‘They are a top quality team, they have got great players and they are always going to create chances. ‘If we had kept 11 men on the park we would have had a good chance. If we had scored a goal we would have put them in a sticky position but it wasn’t to be. Bob Marley assassination? CIA killed reggae star claims fuelled T.I.